To celebrate spring and to coincide with the upcoming film adaption starring Carey Mulligan, the group read the quintessential ‘rural read’ – Thomas Hardy’s Far from the Madding Crowd. To quote myself at book group, ‘Why has it taken us over four years to read this book? !’ Far from the Madding Crowd embodies the Museum of English Rural Life, and there are so many elements of the novel that correlate with our collections. Within the first few pages there is a mention of a spring wagon and countless other objects we hold within our collections. Far from the Madding Crowd tells the story of Bathsheba, a young woman who inherits her uncle’s farm and decides to run it herself. While running the farm, Bathsheba becomes the target of three potential suitors: the wholesome Shepherd Gabriel Oak, the lonely and wealthy Mr Boldwood and the handsome but dastardly cad Sergeant Troy. It is this narrative that drives the story, which is filled out with events on the farm. 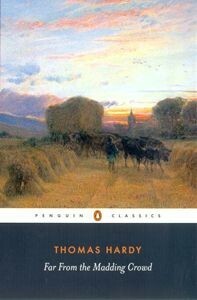 Hardy provides the reader with an accurate and vivid portrayal of living in the countryside in the nineteenth century. The various roles and the ways in which work revolved around the seasons are colourfully revealed with sequences that involve everything from thwacking the corn through to sheep dipping. Gabriel’s role as a shepherd caring for his flock is expertly told; Hardy uses the romantic vision of the lonely shepherd to add to Oak’s character but also delves into the technicalities and realities of shepherding. Much of the group’s discussion focused on the personalities of Bathsheba’s three love interests. We furiously debated Captain Troy’s return and whether he was attempting to repent for his past actions that had resulted in Fanny’s death. A few members of the group believed he was a reformed character where others were not so convinced and still believed him a shallow cad. A sense of community encircles the novel, a tight knit rural community where everyone has their role and gossip is always rife. As a group we really liked the ‘yokel’ characters that populated the book; Hardy used them to provide that sense of community. Overall the group enjoyed the book; I personally loved it and I think that every member of staff here at MERL should read this book (we are making inroads!). For month of May we’re reading The Dig by John Preston. Join us!